Another day chasing the light and fixating on this old shed. Didn't realize the light was changing. Good thing I took some photo's. I will try to finish this tomorrow. Kinda loosing interest, but I have to say it was still great fun. Listening to Tony Orlando, my daughters dvd. I've been baby sitting her two boxers. So my dog Mac, Mabel and Mistro enjoyed the sunny day. Another study of the shed, using black watercolor. Today is a sunny day, so I will try a different composition of the same old shed. Happy sunny Saturday. It's about time. 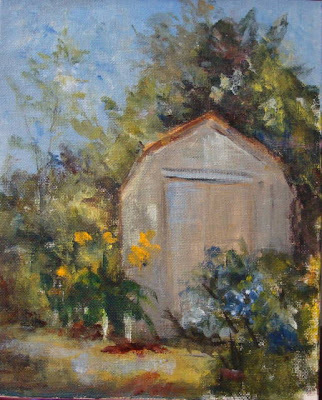 I was outside painting plein air, this old shed my husband built. 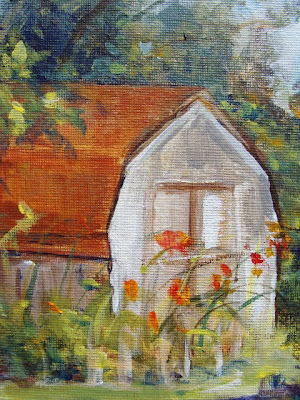 I wanted to paint the day lily's, so I really needed the shed in the painting. Wow, buildings are very difficult, correction it's all difficult. But I love it all. Have a great weekend. Oh, I will do just a little more on this shed, I'm sure the perspective if off. I'll worry about it tomorrow. 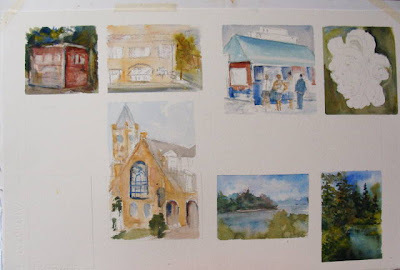 Buildings, people and scenic thumbnails in watercolor. It's another rainy day on Long Island. While waiting for the sun, I did these quick sketches. I would like to do the historic buildings in Patchogue. Reese's Pub, and this old church. The little sketch of the shack and the people is Ralph's Italian Ice, which my family and I enjoy the delicious flavor ice's. 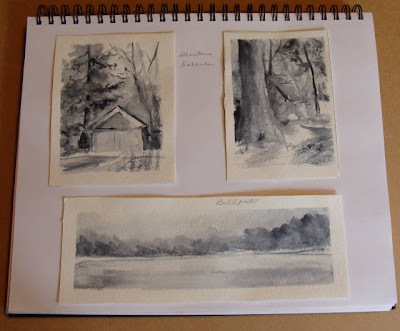 Black and white studies in watercolor of Aboretum in Oakdale. Once again inspired by Maggie Latham. Need to also take better photo's. Mario, also had a suggestion, doing my black and whites, coal, or ink. Will do. Mario is a very talented artist in Italy. 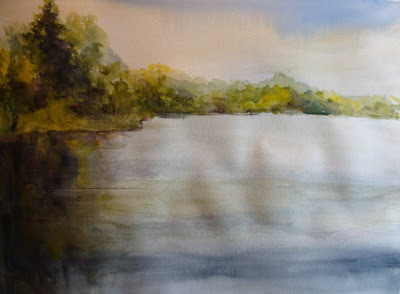 and Cathyann over at http://cathyannburgess.blogspot. 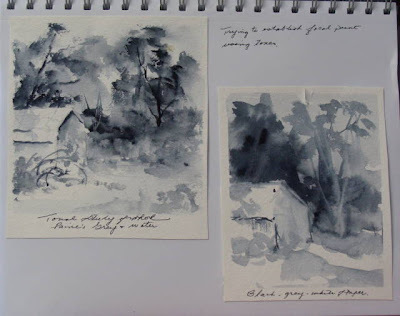 Thank you to Maggie Latham, for inspiring me to do tonal studies. They are fun and a great help. 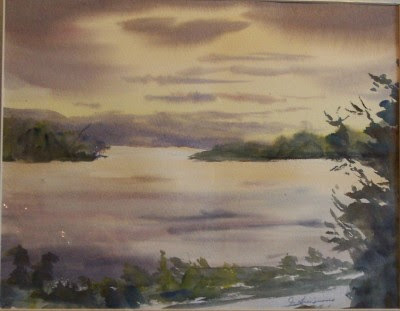 The first of the two, was a watercolor, using only black and yellow paint. The second in acrylic on paper using black, yellow, and white. 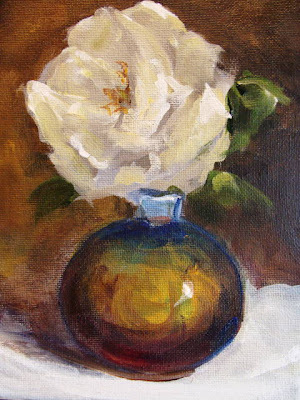 White Rose from my garden. Just a little bit more tweaking on the background. From my garden. 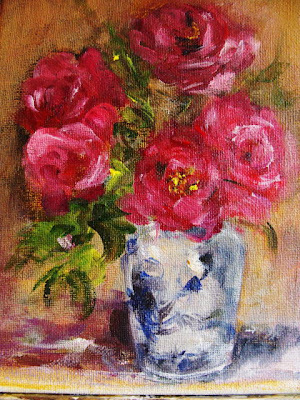 Roses, still needs the correct tones. I'm trying to hard today. I will try again tomorrow. 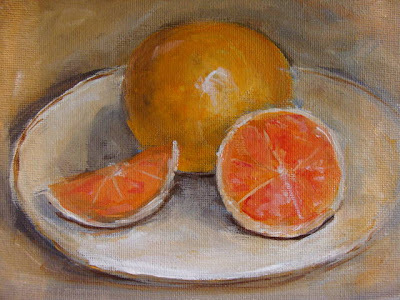 Study of pink grapefruit. 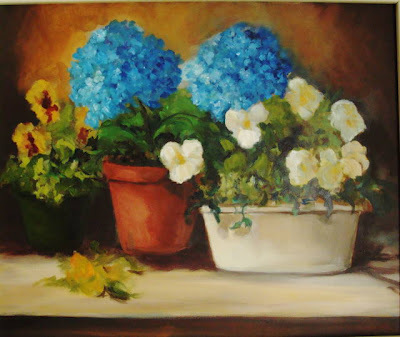 6x8 on canvas panel. 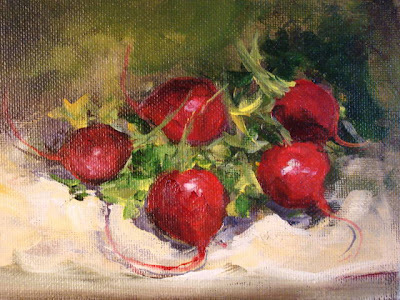 5x7 acrylic on canvas panel. In the studio at 7am to noon. This week is going to be fruit and veggies. 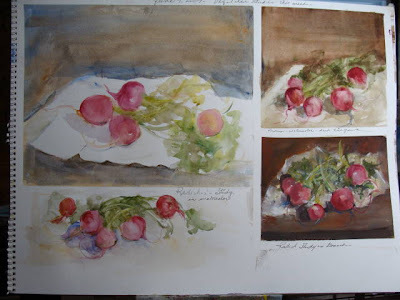 Today it is a study of radishes in watercolor and gouache. 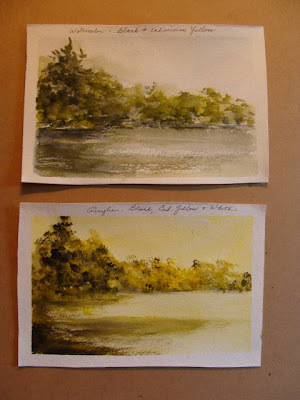 Watercolors studies. Well that is it for now, hopefully I will have some new work soon. These paintings were done in the 90's, my gosh were does the time go. 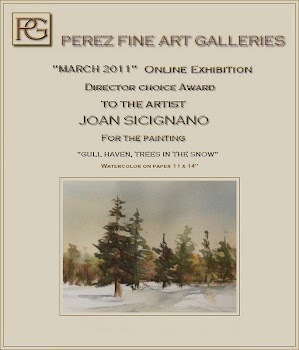 I have been busy with new work and getting ready to do a show this weekend.